Sunny skies and 8-10 knots of westerly breeze provided perfect conditions for the the final start of the 2013 Transpacific Yacht Club’s race from LA to Honolulu, the Transpac. After a celebratory send-off from Rainbow Harbour in Long Beach, twenty-one of the fleet’s fastest monohulls and two large fast multihulls started at 1300 off Point Fermin on the their way to the finish line at Diamond Head, 2225-miles away. The 47th running of this classic race run since 1906 now has all its 58 entries on the race course. Taking an early jump out of a pack of fast offshore designs that includes a Reichel/Pugh 74, a Volvo 70, a STP 65, several TP52’s and a pack of ULDB 70-foot sleds is Australian Syd Fisher’s Elliott 100 Ragamuffin 100. 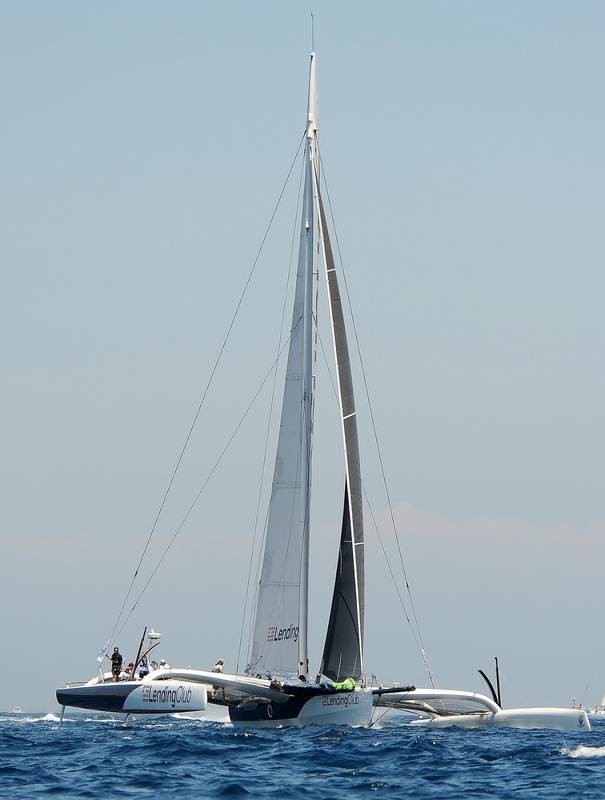 Fischer has chartered the canting-keeled boat for this race, which is capable of breaking the current monohull race record of five days, 14 hours, 36 minutes, 20 seconds set by another 100-footer, Alfa Romeo II in 2009. “We are planning to campaign our 90-foot canting keeled boat for the Rolex Sydney-Hobart Race later this year and we wanted to learn how to race these boats. They are extremely fast and we expect to learn a lot in the next few days,” Syd Fischer said. Chasing Ragamuffin to the first waypoint at the West End of Catalina Island 25 miles away was David Askew’s R/P 74 Wizard, who as Belle Mente two years ago set a new course record for a fixed keel boat. Strategist Dee Smith explained last night that the weather will be a big factor for the success of this group starting today. “We will have good but not great breeze getting off the start. This will become better tonight through to tomorrow night. The bigger, faster, and more stable boats will be able to stay close to the rhumbline and go fast, while the smaller, slower and less stable boats will have some tough choices to make,” Smith said. “This will be a very interesting race. The position of the [North Pacific] High is very dynamic now, moving constantly, with a very active jet stream. So, if the models for 96 hours out are correct, it may pay off for some boats to be to the south for the later phases of the race when there is a shift that will be to their favor. But it will be extra miles to go that way, so its not an easy choice now, and they will have to keep their eyes on the progress of this High,” said veteran weather forecaster Ken Campbell. 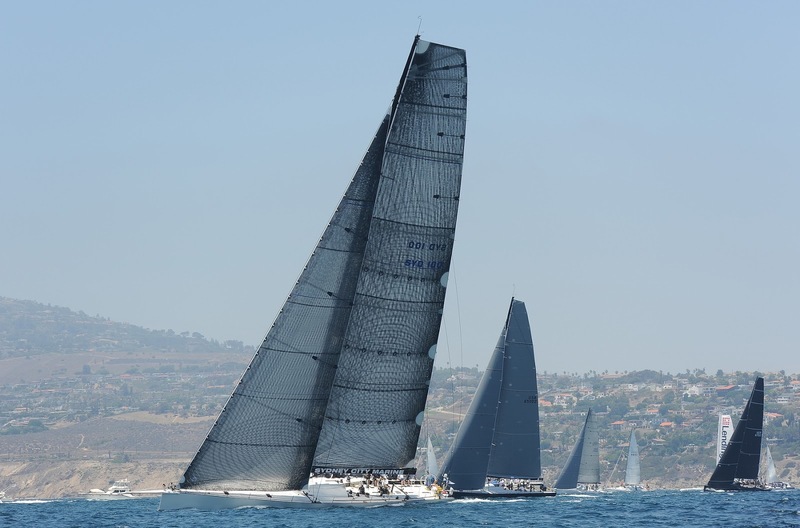 Today’s start features several newcomers not only to the Transpac race but to racing in the Pacific altogether. Jens Kellinghusen’s Ker 51Varuna 51 from Hamburg, Germany is on a world tour competing in some of the world's greatest ocean races. “We only launched the boat last year. We sailed in the Mediterranean last season and have been in the Caribbean this past winter,” Kellinghusen said. Five boats in Division 3 will be racing in a revival of the ULDB Sled class, with one boat even celebrating this with it's name Santa Cruz 70 Retro. These yachtsand the Andrews designs ruled the Transpac race throughout the 1980’s and 1990’s and the group is again poised to enjoy close tactical sailing all the way to Honolulu. Of the two multihulls starting today, John Sangmeister's modified ORMA 73 trimaran Lending Club looked a little faster through the water than Lloyd Thornburg's Gunboat 66 catamaran Team Pheado, but the bright orange catamaran is likely pick up the pace once into the stronger 15-25 knot breeze forecast for tomorrow.